Snorting Heroin: Can Heroin Be Snorted and How to Sniff Smack Drug? There are various heroin nicknames on the street. The drug is available in various forms, commonly as a brown or white powder or a sticky black tar-like substance. Is one method of administration more dangerous than others? How does snorting compare to injecting? Read on to learn more about snorting heroin symptoms and the risks of this route of administration. Why Do Addicts Snort Heroin? What are the Risks and Dangers of Snorting Smack? What are the Signs and Symptoms of Snorting Heroin? People use opioids for their euphoric and analgesic effects. These drugs activate the pleasure centers in the brain and create a feeling of detachment from reality. Can you sniff heroin? Yes, heroin users administer the drug in a number of ways, including smoking, injecting, and sniffing heroin. Can you snort heroin? Yes, snorting involves inhaling heroin powder forcefully into the nasal cavity through a rolled-up piece of paper, banknote, or straw. Injecting a substance directly into the bloodstream produces a high within a few seconds. Heroin snorted is absorbed more slowly and can take up to 10 minutes to produce an effect. 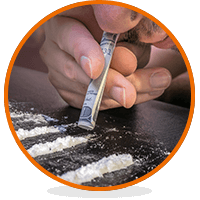 Although not as quick as the injected method of administration, snorting allows the illicit substance to enter the bloodstream and cross the blood-brain barrier relatively quickly. A heroin snort, therefore, provides a fast and direct route for the drug to reach the brain. This produces a rapid and intense high which many addicts crave. Do not share snorting equipment such as straws or banknotes to avoid the spread of infections through microscopic specks of blood. 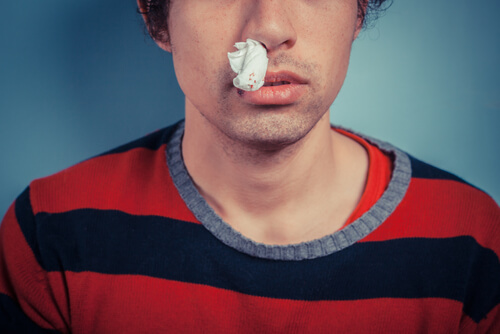 Rinse the nostril after snorting to remove excess substance and reduce the risk of damage to the nasal mucosa. Alternate snorting between nostrils to minimize the risk of damage. There are many reasons why addicts prefer snorting over injection. There is a greater social stigma attached to intravenous drug abuse compared to other types of administration. Snorting heroin is popular among people who are averse to needles and needlesticks. It also does not require liquefying the substance. There is no need for specialized equipment such as a syringe and needles. Addicts who want to avoid the tell-tale signs of drug use, such as track marks on the arms, also prefer methods such as smoking and snorting. Because it does not involve needlesticks, there is a reduced risk of infections such as hepatitis and HIV with nasal insufflation. There is a misconception among some addicts that snorting black tar heroin or other forms of this illegal substance is less dangerous than injecting it. Some people are under the false impression that snortable heroin is less addictive compared to the injected form. The truth is that this substance is highly addictive and can lead to serious health consequences including coma, overdose, and death, regardless of the method of administration. Some street dealers cut an illicit substance with a cheaper adulterant for a profit incentive. Fentanyl is often used to cut heroin and is an extremely potent substance itself that is fat-soluble. Heroin and fentanyl mixture is able to cross the blood-brain barrier even more quickly, and this can result in a snorting heroin overdose that can prove lethal. Other red flags include things such as residues of brown or white powder on furniture, rolled up pieces of paper with a unique smell, and straws or other paraphernalia of drug use. In addition, the signs of addiction such as changes in social behavior, grooming habits, and meeting deadlines can be indicators of a drug habit. Opioids are extremely potent substances with a high risk of addiction and overdose. What might begin as an experiment or occasional heroin snorting can quickly turn into full-blown abuse. But there is hope for people struggling with an addiction to these dangerous substances. The first step is the need to understand the grave dangers of using them. The next step is to seek appropriate treatment for substance use disorder, consisting of detoxification, rehabilitation, and aftercare. Snorting heroin withdrawal can produce many uncomfortable symptoms. For this reason, detox without medical supervision can be dangerous. Professional addiction therapy can help recovering addicts withdraw safely from this substance and achieve long-term abstinence. A number of inpatient and outpatient drug rehab centers around the country offer programs to help addicts get on the road to recovery. It is important to remember that addiction is a lifelong problem and does not end when drug use stops. Aftercare services are critical in the prevention of relapse and a healthy, happy, drug-free future. If you or someone you love is snorting heroin, call our free helpline (888)-459-5511 for more information on beating the addiction. Advisors are available to answer your questions about the effects of snorting heroin, give you more information on safe withdrawal from drug abuse, and guide you towards long-term recovery. Calls are always confidential and secure.